This was the opinion of Sir James Mellon, the British ambassador to Copenhagen from 1983-86 and author of ‘A Danish Gospel – the Life of our Lord Jesus Christ’, a handsomely-illustrated book with pictures from medieval Danish churches (published by Centrum Forlag, Viby). During his period as ambassador to Denmark, Mellon and his wife travelled all over the country visiting and photographing more than 200 medieval churches – a leisure time hobby which became a passion. “One of the great art treasures of Denmark is its church art of the Middle Ages … painted by totally unknown artists,” enthused Mellon. In contrast to the abstract art of the Viking period, the frescoes in Denmark’s medieval churches reveal a southern European influence with earthy naivist murals depicting the life of Christ and the saints in scenes from the Bible, using local Danish peasants and farmers as models and peasant faces, providing a fascinating glimpse of how Middle Ages congregations looked as well as how they visualised the Old and New Testaments. The frescoes provide not only earthy pictures of the lives of the saints, but also images of the lives of contemporary sinners in village society. The superb and lively, rustic and realistic murals in Danish churches date from the end of the 12th century to the late 16th century. As Mellon points out in his book, the bulk of the medieval wall paintings were whitewashed over during the Reformation in Denmark. They were only brought back to light and renovated during the past hundred years or so. 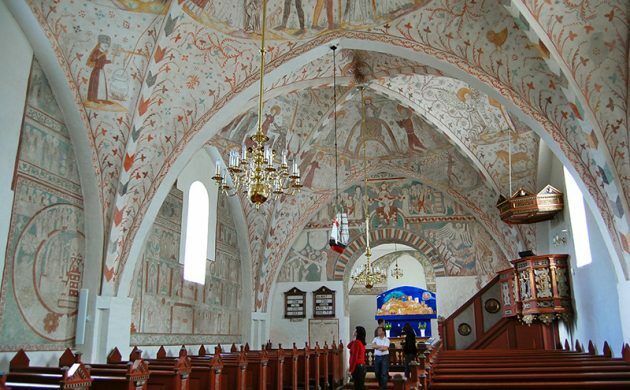 These medieval church murals are an unknown aspect of the country’s culture – not only for foreigners but also for many Danes. Churches in the Greater Copenhagen area with stunning medieval murals include Måløv and Ballerup to the west of the capital, and Jørlunde, Nørre Herlev and Søborg further to the north of Zealand.